What in the world is a Peanut Butter and Jelly Deli? We’re flying right through 2016 and laser focused on our goal of backing sustainable projects that will be around for years to come. We’ve done projects in the snowy mountains of Iraq and the urban landscape of poverty-stricken Detroit. Next up, we’re headed to sunny St. Pete, Florida to start a food truck! We’re partnering with long time H4AD friend Blake Clark to launch a food truck with a 1-for-1 model. You’re probably familiar with TOMS shoes. You buy a pair of stylin’ shoes and TOMS also donates a pair to a needy recipient. We’re bringing that to food trucks! For every sandwich sold; a sandwich will be donated to the homeless and needy! 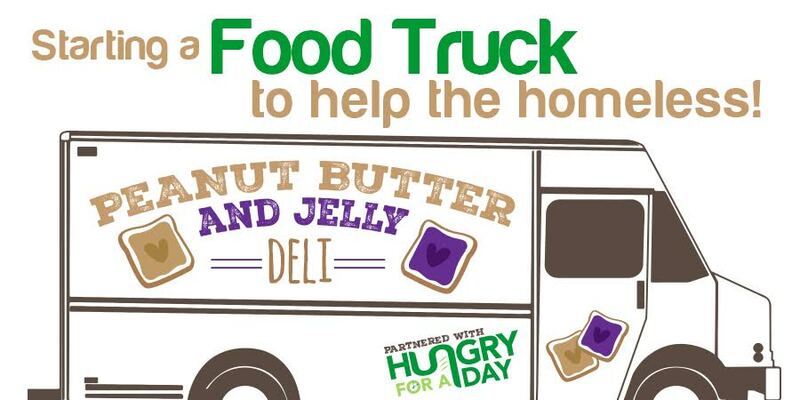 What’s even cooler about Peanut Butter & Jelly Deli is they’ll be putting the homeless to work! Part of their staff will be covered by a someone that is trying to re-enter the workforce. Such an amazing concept and Hungry For A Day is excited to get this truck rolling! Here’s how you can help. We need to raise $25,000 to get going. We have a faith partner – Radius Church as well as some individuals partners that believe in not just giving back to this community, but ending homelessness one employee at a time!